I had to go into the office today, so I missed the official grand opening hoopla over at Mugs Cafe, the new coffee shop in Argenta that I gave you the heads up about a little while back. After a meeting and some paperwork, I still had more stuff to do, and my weary body was non-cooperative. Needed caffeine. 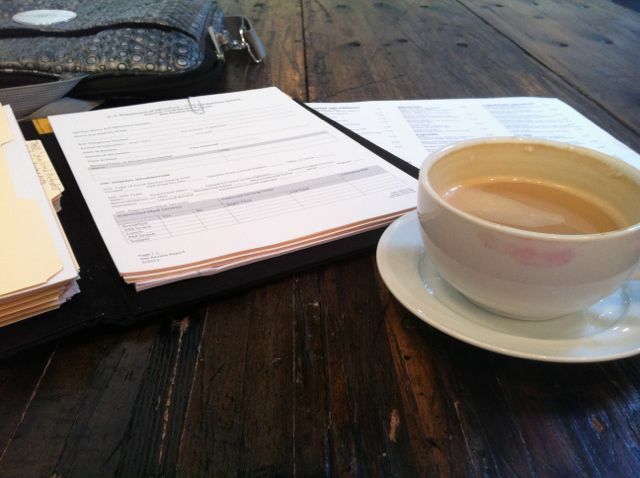 My paperwork and my enormous, shockingly inexpensive, delicious latte. So, off to Mugs Cafe I went. The space is gorgeous, y’all. Open and airy, with a sense of “come hang out,” which was completely the idea. 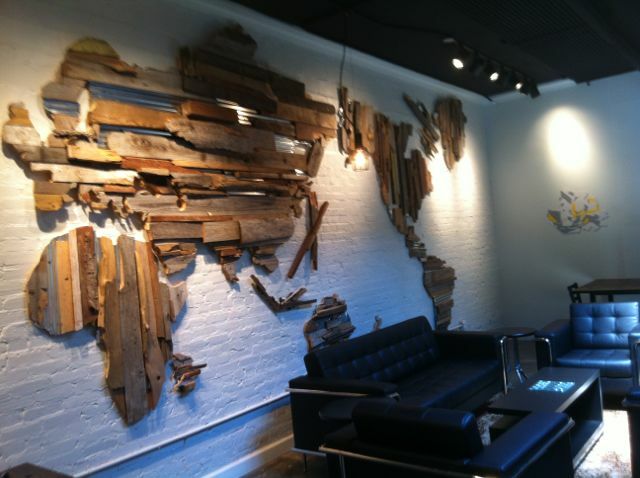 A lounge-ish area in the back has this amazing global collage on the rear wall. The menu is nice (think what your showoff, Food Network addict cousin would make at home: french toast, fancy sliders with runny eggs) and really, surprisingly cheap. Like I wonder how they’ll make money cheap. Everything, even the glutinous stuff I can’t eat, looks well executed. 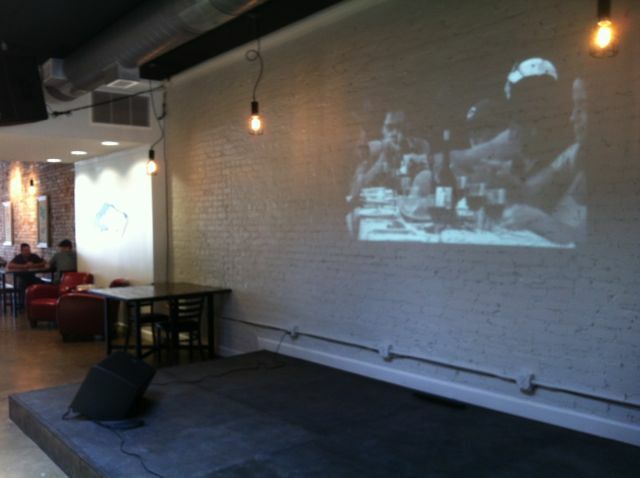 I’m not sure if the video on continuous loop against the back wall is a permanent thing, but I love it. It was a video of an outdoor community dinner. All I had today was a much-needed latte, but I’ll be back tomorrow (on an also-much-needed day off) with the kids for breakfast. Just wanted to show you guys a few photos from the new space. And yes, the coffee is still every bit as amazing as I told you about before. (You can buy beans to take home!) Check the Twitters for my report on the food. 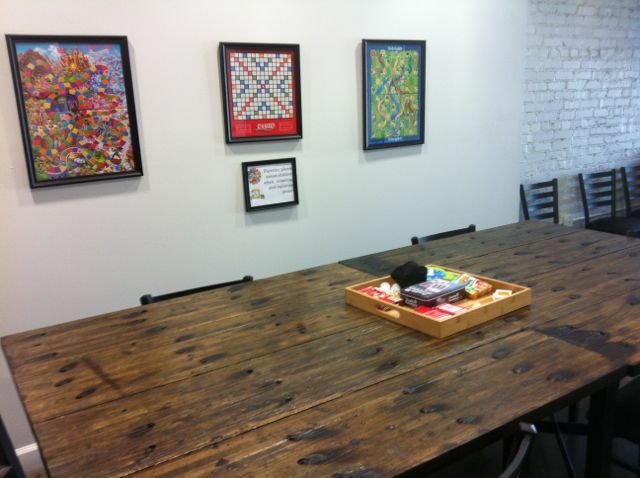 A large table invites kids (or whoever) to hang out and play board games. In the window of the former Allied Printing building in Argenta. I’m currently grieving the fact that my husband and I have polished off a sample bag (okay, two bags) of some of the most extraordinary coffee we’ve ever had, and it may be a couple months before we get more of it. 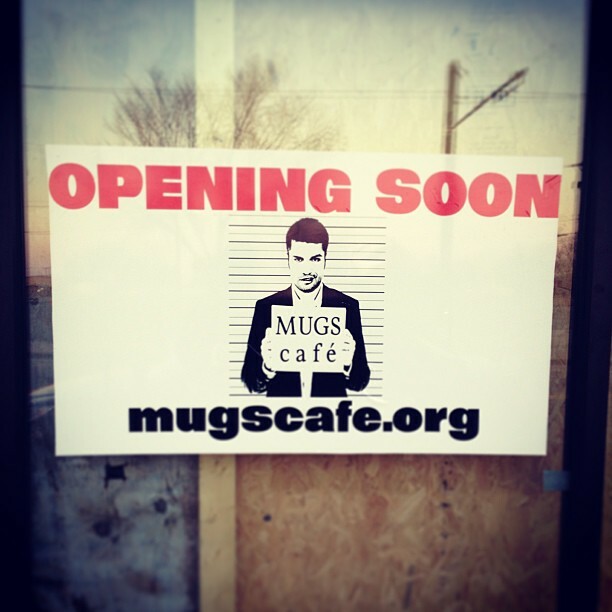 The coffee was a promotional sample from the guys at Mugs Café, which will open this summer in the Argenta area of North Little Rock, giving the popular neighborhood its first true coffee shop hangout. Exactly how I got said sample is part of a bigger story. Hang with me. Alas, my sample (like these pictured) is gone. 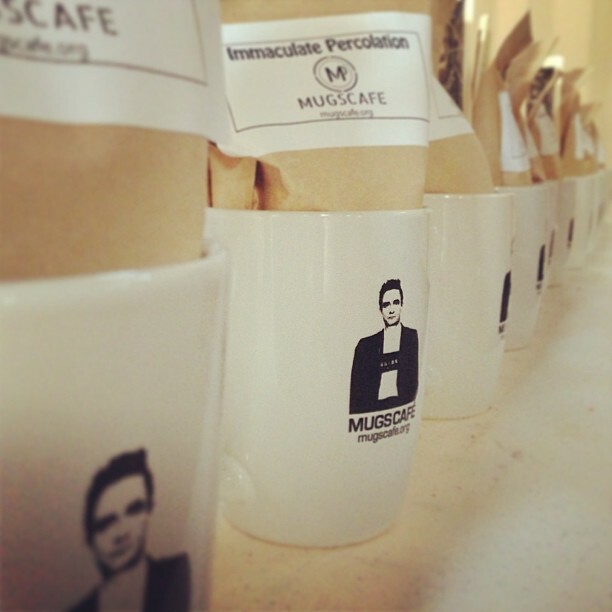 Mugs Café will serve more, promise. 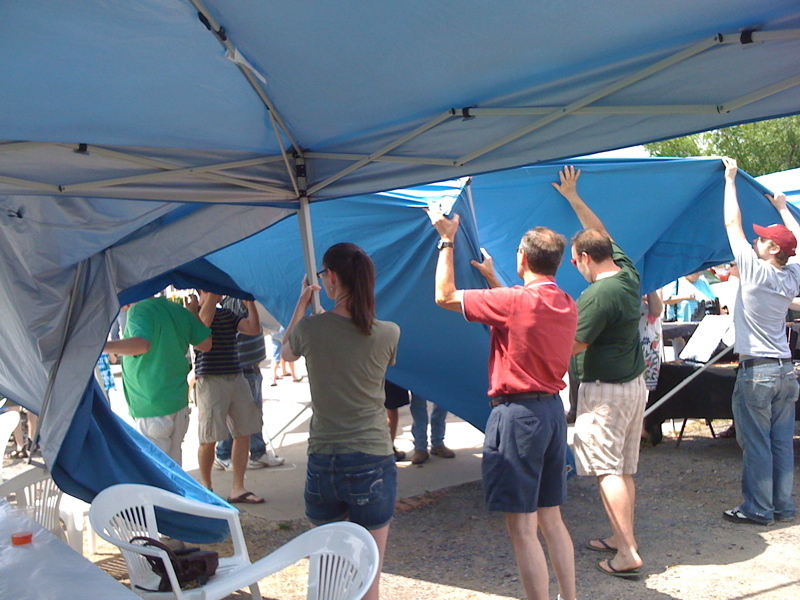 Third Place refers to the writings of sociologist Ray Oldenburg in his 1989 book The Great Good Place, who described the importance of neighborhood gathering spots that came only behind home and work in their frequency and length of visits. Construction work has taken over the former Allied Printing space, updating it and making it restaurant-ready. The tentative menu listed on their website includes a pretty serious-sounding coffee collection, as well as pastries, sandwiches and desserts from basic to somewhat upscale. For breakfast, you will be able to build your own three-egg omelet or indulge in a breakfast bagel with fried egg, bacon and smoked gouda. Lunch offers a variety of salads, sandwiches and such, including cranberry turkey sliders or a chipotle chicken wrap. The proposed selection of gelato also caught my eye, including chocolate jalapeño and salty caramel flavors. The coffee I sampled, named “Immaculate Percolation,” was honestly nothing short of astounding, and I’ve had a lot of coffee. When I asked Carpenter to describe it and its origins for me, he waxed on like a sommelier in a fine dining restaurant. “The coffee beans are roasted by Bongo Java in Nashville,” Carpenter explained, “who imports high-quality, organic green coffee from small-scale farmer organizations to build long-term relationships and foster fair and equitable trading practices. Immaculate Percolation, the coffee you tried, is a dark-roasted bean that comes wrapped in generous amounts of natural dark chocolate and molasses flavors. The smoky aroma compliments a heavy, syrupy body and slightly dry finish. Yeah, exactly what I was thinking. All I know is that it was amazing, and I’ll be first in line for more when the time comes. If you haven’t guessed already, Carpenter isn’t exactly what you’d expect, in a number of ways. And this is what brings me to how I got the sample. He’s a restaurateur, having experience with a similar coffee shop concept in Lebanon, Tenn. before moving to North Little Rock. Oh, and he’s a minister, too. In fact, Carpenter and his crew of bearded co-horts aren’t just businessmen, they are church leaders with the Southern Baptist Convention. The coffee shop will serve as a meeting place for The Church at Argenta on Sundays, which is currently meeting in homes in the area. My husband and I received samples at our church here in North Little Rock, which will be partnering with the “Argenta boys,” as we call them, in their endeavors. Don’t freak out. Stay with me, here. “People ask us if this is a coffee shop or a church, and the answer is yes,” joked Cliff Hutchison, who will serve as the church’s worship pastor. 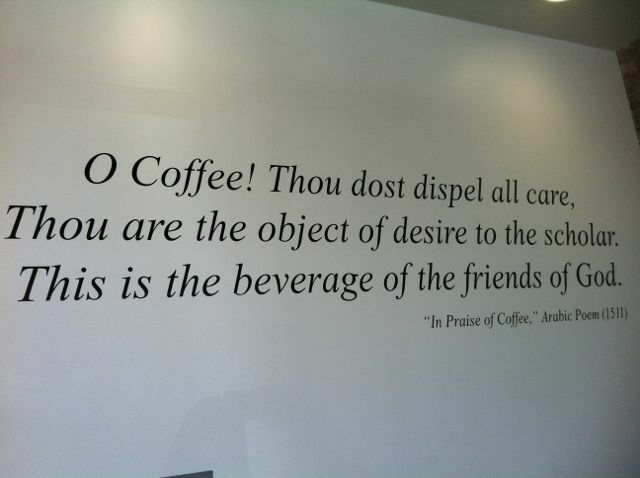 If that’s not exactly your cup of coffee, though, don’t worry; they don’t plan on proselytizing to customers. Curious? Meet the Argenta boys yourself at an open house they’re holding on Thursday, April 4, starting at 4:30 p.m. Drop by after work and try some coffee and samples of upcoming menu items. 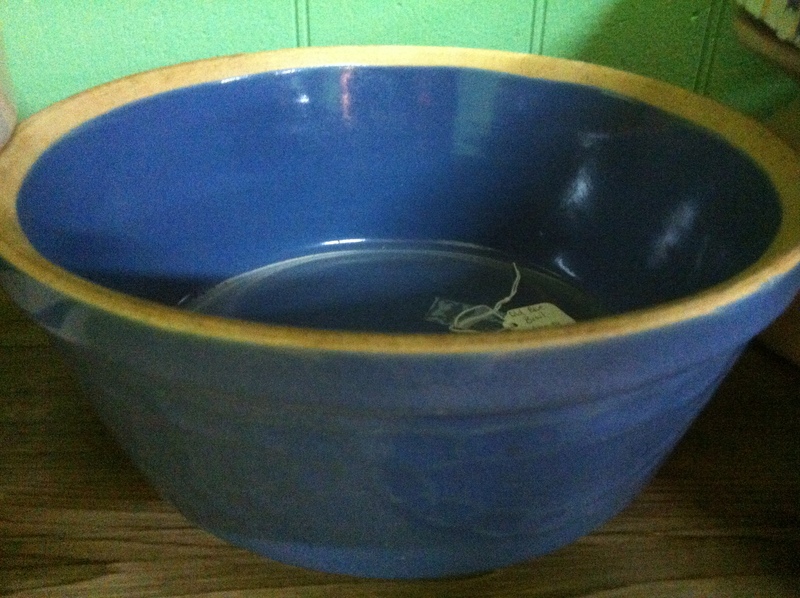 I really, really wanted this bowl, but I really, really don’t need another one! 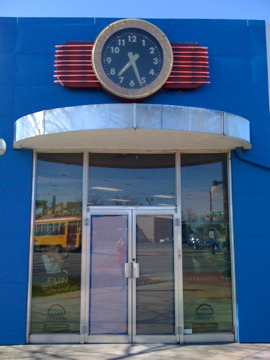 My hubby and I have always had this thing for junk shops, antique stores and estate sales. Since kids have come along, our budget and willingness to drag them along have not been as forthcoming. But, occasionally, we’ll venture out and take a gander at the very latest in the fairly old. 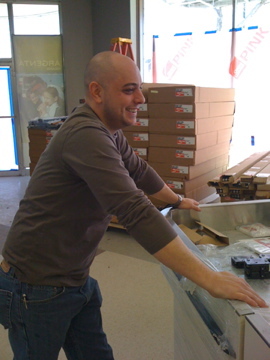 This weekend, we did, in search of a desk for my work area in the kitchen. Of course, I tend to gravitate toward kitchen stuff. Old bowls are my favorite. Next in line are clunky, rough wooden tables and gaudily-colored relics of our culture’s culinary past. We didn’t find the desk I was looking for, except for one tiny beauty that was already sold. But we enjoyed all the foodie fabulosity of times past. Check them out! Yup, it’s true…I set myself up for an April Fool’s joke of my own. In my earlier preview of Argenta Market, the long-awaited neighborhood grocery in the trendy downtown area of North Little Rock, I reported the opening to be slated for April 1. “No fooling,” I said. But proprietors Shane Henderson and Jody Hardin would rather get it right, a little later, than stick to an arbitrary date. And get it right they did. This morning, a crowd of about 100 pressed against the grocery’s outer walls as government dignitaries and folks from the Argenta Downtown Council and the Argenta Community Development Corporation congratulated each other and opened the market to the public. 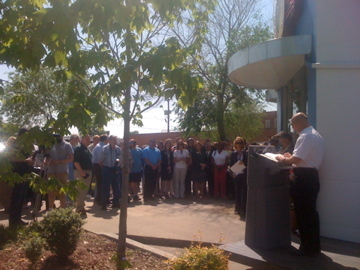 After a quick ribbon cutting, the crowd practically swarmed to enter. An hour later, as I sit at the market’s laptop-friendly lunch bar against the window-glass front wall, the room is still buzzing. Several of the newly indoctrinated patrons are staying for lunch, freshly prepared by Chef Shane Henderson and dished out at the deli counter, salad bar or to-go pick up area. And 20 to 30 folks, some of whom have wandered in after the opening, are still buzzing about the store. 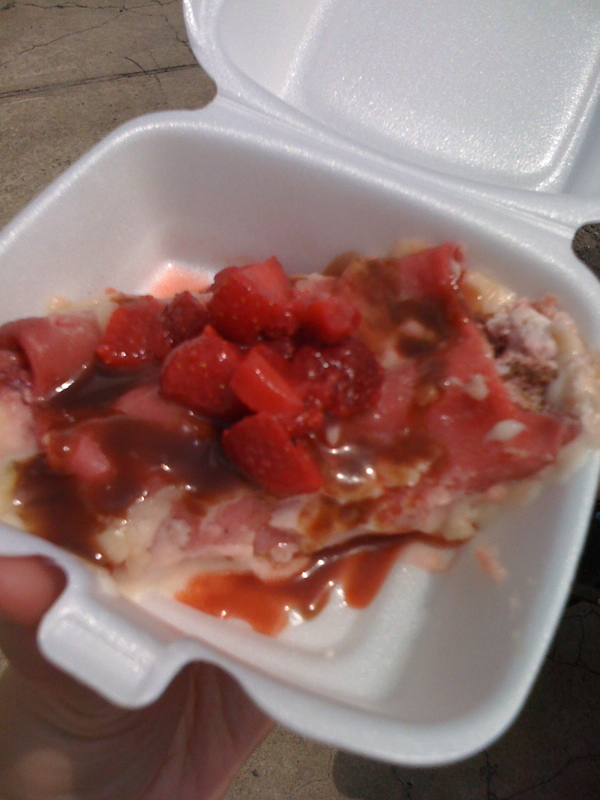 Several patrons are just downright giddy at the selections, today including some Hardin Farms strawberries that were still sucking minerals out of the dirt yesterday. I was pretty giddy myself when I looked in the super-cool Coke cooler (which, I’m told, was the first of its design in Arkansas) and found — get this — Mexican Cokes. You know, the ones with real sugar instead of corn syrup. That alone, my friends, is reason enough to get over here. There are still a few kinks in the system: many items not yet in the PLU system, and (yipes) no bottle opener for the aforementioned Mexican Cokes. But these things are expected with a new store, especially one as home-grown and locally-operated as Argenta Market. But what is good — aisles of Arkansas-grown (and otherwise, as necessary by climate) fruits, veggies, meats and more — far outweighs the store’s first-day growing pains. I plan to whip up a nice pasta dish with the fresh goodies I pick up today, and come back later in the week for fresh meats for the week’s menu. 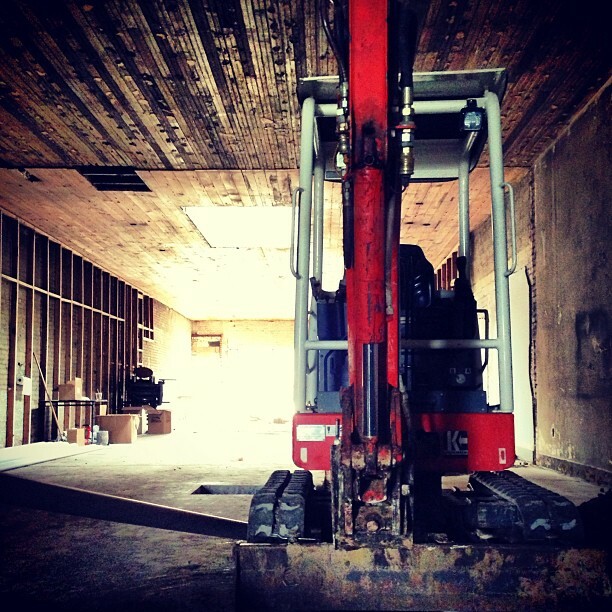 UPDATE: Chef Shane has nudged the opening date to April 15. And he really, really means it this time. April Fools to whoever came by on the 1st, I guess. Walking in the back door of the long-awaited Argenta Market a little over a week ago, I couldn’t help but think of E.T. You know, the movie…in the 80s…never mind. If you’re under 30, Google it. The entire 7,000-square-foot space was partitioned with giant sheets of plastic wrap, much like the foreign creature’s host house in the movie. 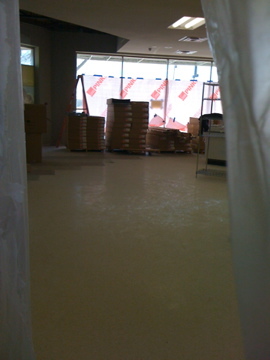 Workers busily scraped and sanded walls, creating a dreamy haze of sheetrock dust. But this dream is no science fiction for proprietor and chef Shane Henderson, who has scheduled the store, a mix of local and mass-produced groceries as well as site-made culinary creations, to finally open on April 1. No fooling. “People were wondering if we’d ever actually open,” Henderson said of numerous delays in opening the market. “I think we ended up with a better store with the delays than if we’d opened one year ago as planned. I think we’d be closed by now if that had happened. Henderson cites lessons learned from months of research and changes in focus, as well as the demise of similar shops in the metro area. One critical decision, Henderson said, was that to include recognizable, mass-produced grocery brands as well as local ones. Jody Hardin, executive director of the Certified Arkansas Farmers Market program, has stepped out of the day-to-day limelight in regards to the Market, although he remains a partner and connection-maker between the store and Arkansas farmers. Possibly the smartest move made by Henderson and Hardin was to hire Neal Augustine of Benton, a 30+-year veteran grocery manager, to serve as manager of the market. “I started as a kid, as a bag boy to make some money, and just worked my way up,” said Augustine of his career in grocery management. He has served as manager for Harvest Foods until its demise; before that, he worked for Kroger for 20 years and Winn Dixie for 12 years. Augustine lit up while listing some of Argenta Market’s upcoming features: seven aisles of basic and upscale nonperishable grocery items, with a notable focus on local, sustainable foods; several varieties of specialty and local cheeses and milk; standard, import and local beers, such as Diamond Bear; frozen foods including Yarnell’s ice cream, Amy’s Organics items, store-made products and exotic meats; bulk bins featuring local coffee, grains and rice, including basmati and jasmine. The market will also provide Henderson the opportunity to get back in the kitchen as a chef, a passion which has been delayed as construction made the site’s kitchen unusable. He plans to offer up to a dozen specialty sandwiches on the deli menu, at least four ready-to-eat items and house-made artisan breads, plus improvisations based on what is fresh that week. He may even get into producing charcuterie (house-made sausage) each week, as well as being able to connect customers’ requests with Arkansas vendors whenever possible. The market will have a full-service deli using Arkansas-based Petit Jean meats, a 6-foot salad bar featuring locally-grown products and seating with a great community view for 24, including Arkansas-roasted RoZark Hills cappuccino and coffee for purchase and free Wi-Fi provided by Urban Wireless. 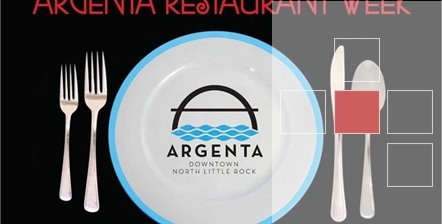 Argenta Market sits, at 6th and Main, in the very center of the Argenta Community Development Corporation‘s plans for the growing, trendy segment of downtown North Little Rock. Saturday, hubs and I wanted to get out and about a bit. The eldest child was staying with my folks, so we just had the 2YO munchkin. Popped him in the truck and off we went. I wanted to get some veggies at the Argenta Certified Arkansas Farmer’s Market, so we went there first. I had forgotten that Saturday was the Big Dam Bridge 100 bike race, with the finish line right next to the market. With a very loud and annoying DJ type, I should add. The market tents had been scooted down one block for the festivities, but all seemed well, with a good crowd and the beginnings of beautiful fall displays. 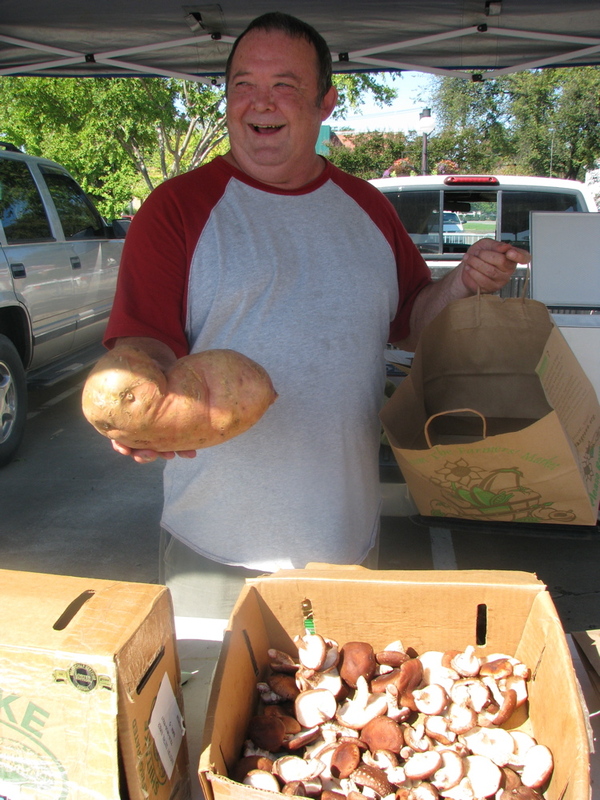 David Owens of Three Buddies, showing a five-pound sweet potato. of Willow Springs Market Garden in Little Rock, although I never really liked radishes before. I’ve found that market shopping encourages you to try new (and old) things. These were called “Watermelon” (or “red meat”) radishes, and he threw in a couple spicy black “Nero Tondo” radishes, apparently fairly rare. Anyone got any cool recipe ideas for all those? I also bought some more fairy tale eggplants from Hardin Farms, since you, my loyal readers, seem to be so crazy about them. The fairy tale eggies land in my “top searched terms” data every day. Weird. Not sure yet what I’m going to do with them, but I’ll be sure to let you know. And we had to get some obligatory pasta from Argenta Market. This time we got handmade garlic fettuccine and fresh pesto. It was really good! Just a tip, though, if you get this pasta…let it come to room temp before boiling for 2-3 minutes, or you’ll have a glob. Did that last time. Erg. We weren’t quite ready to go home yet, so we decided to trek over to the “other” market at the River Market. Not being a morning person, I had never actually caught this one when it was still going, and after meeting the Argenta folks I was a little partial to them. And there was the whole “is it really from Arkansas” thing. I decided to go ahead and investigate. I was surprised at the plentiful tables of produce, often much more than the Argenta growers had. But this made me wonder…is it really local? Of those with overflowing tables, I wasn’t sure. But there were also some proud farmers who wanted us to be sure, with bright signs declaring their local origination. “All our produce is from Arkansas,” or some such. One sneered to me about the table down the way that still had PLU stickers on the veggies. Clue! The other treasure was swooped upon partially because of my hob-nobbing at the Arkansas Hospitality Association convention. 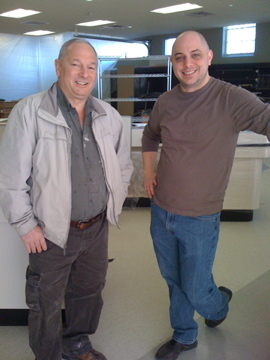 There, I had the privilege of chatting with Chef Donnie Ferneau of Ferneau. *swoon* His equally charming dad was at the River Market, selling Donnie’s trademark spice mixture and bragging about all his children. Too cute. We bit, and although it seems a tad gimmicky, the mix really is pretty unique and yummy. We think it’s the fennel seed. I really wanted to hate the River Market’s, er, market, but it has some really great vendors. Several are truly local, and even the ones that may not be are fun to look at. But as for a weekly habit, I’ll stick with Argenta. It’s absolutely local, I love the people, and just feels like home. So there.